... are able to play a wide range of styles that will entertain any audience. Jive, Stroll, Boogie Woogie and a touch of Rockabilly, there is something for everyone. Songs from the current set include tunes such as Rockin’ my life away / Boogie Woogie Queen / Ole Black Joe / I Knew the Bride / Paralyzed / Tears on my pillow / Queen of Hearts / 55 Ford / Hoppin Honey / Two-timing lover / I know why / Dance girl dance / Matchbox plus many more of your favourite hits of the Rock ‘n’ Roll era. 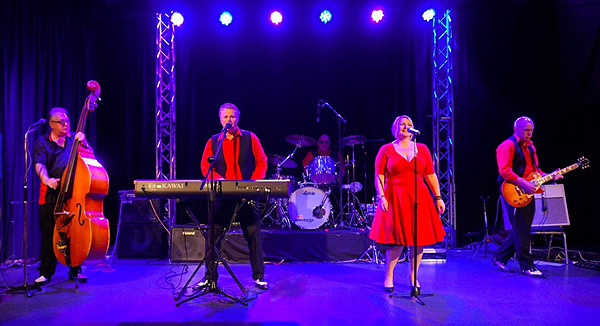 Rock Back the Clock are here to rock back the years and bring back those happy memories of coffee bars, juke boxes, crepes and drapes. We feature all the truly memorable hits from the 50’s artists, Jerry Lee, Janis Martin and of course Elvis. Also popular songs from some of the new bands, The Lennerockers, The Firebirds and Eva Eastwood, that keeps you on your feet, dancing the whole night through. Have you still got the energy?